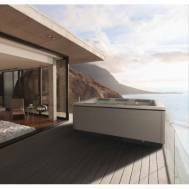 Outdoor whirlpools by Villeroy & Boch stand out from standard market versions. You will be won over by their innovative technology, above-average energy efficiency, outstanding design and high level of comfort. We offer products with high-quality equipment in all price segments. Contact us using our contact form and arrange a meeting directly.